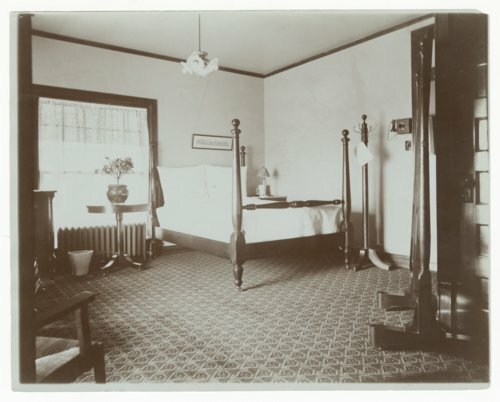 This photographs shows a furnished bedroom at the Atchison, Topeka and Santa Fe Railway Company's Fred Harvey Bisonte Hotel in Hutchinson, Kansas. The eighty guest room facility designed by architect J. G. Holland opened in November of 1897. For a number of years the hotel provided accommodations until closing in the late 1940s due to the decline in rail services. The building was razed between 1964 and 1965.